How to give bible talks that challenge and inspire. We've all sat through Bible talks and sermons that meander, go nowhere or are just plain dull. In this practical guide to the art and skill of preparing and delivering Bible talks, seasoned preacher Tim Hawkins shares his wisdom and experience on how to do it better. Tim urges us to preach like train drivers - who consciously want to take people with them on a journey that arrives at a worthwhile destination. * engage people with God's word - right from the word "go"
* illustrate and apply talks in a way that is faithful to the Bible, and effective in the way it is received. The book is underpinned with a confidence in God's Word applied by the Holy Spirit as God's agent of change. But it takes seriously the gift-ing and responsibility of the preacher to deliver messages that move. 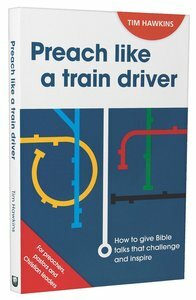 About "Preach Like a Train Driver"
Customer Reviews For "Preach Like a Train Driver"
A preacher and a train driver have a common task. They are both responsible for taking people to a destination. For over thirty-five years Tim Hawkins has successfully engaged his listeners so that they might be transformed by God's Word. In this practical guide to the art and craft of preparing Bible talks, he equips his readers to deliver messages that move. Know where you are going. Make sure that your audience is onboard. Avoid getting lost on the way.